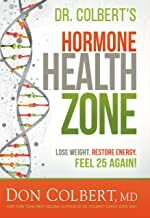 In Hormone Health Zone Dr. Colbert informs readers how they can optimize their hormones to become healthy and fit. The results of hormone optimization includes increase energy and strength, better moods and memory, feeling younger and happier and more. In Let Food Be Your Medicine Dr. Colbert offers dietary changes using a modified Mediterranean diet. Learn what to eat and what not to ear in order to know how food choices affect diseases. Also included are meal plans, recipes, tips on supplements and more. The Daniel Detox offers a 21-day plan to cleanse teh body of harmful toxins. The detox is designed to restore health. This twenty-one day protocol supports the liver and detoxifies teh body. Living in Divine Health is a journey into the world of disease preventing nutrition that includes medical research as well as biblical insight. Physician Don Colbert tell readers how to eliminate cancer producing toxins, learn to differentiate between foods that generate health from foods that hurt your heart, learn what to do about fat because fat "is where the poison is", unleash good fat, challenge deadly nutritional advice, become friends with miracle foods.